You are here: Home / Food / Is there Such a Thing as Healthy Fried Food? I say yes, healthy fried food is possible! But for a different reason then you might be thinking. Everyone is really into air fryers right now, but that’s really just a convection oven by a different name. Air fryers don’t fry food – they air bake! Let me set the record straight: I like baked chicken. But if I want my chicken fried, I’m not putting it in an oven! Some people say anything fried is not healthy. 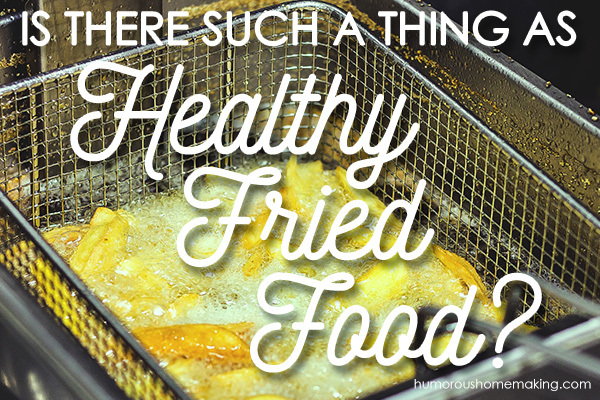 But I always say everything in moderation – and that includes actual fried foods. If you are going to fry, use the healthiest oil possible! Before we became health conscious, I was using Crisco. ALL. THE. TIME. I was the Crisco queen. I was so greasy. Now I’m just oily (ha!). When I cut out Crisco so we could be healthier, I thought it was the end of fried foods. But I was wrong. I truly mean it when I say I think there IS such a thing as healthy fried food. Tropical Traditions was one of the sponsors of Humorous Homemaking’s Watch Your Month Challenge. I specifically chose sponsors I love and have worked with for a long time. But this is NOT a sponsored post. I’m just sharing this because they are one of my favorite companies to talk about. I genuinely love and use sooo many of their products. From Tropical Traditions: “Palm shortening is derived from palm oil (read about Virgin Palm Oil here). In its natural state, palm oil is a mixture of saturated and unsaturated fatty acids, with most of the unsaturated fat being monounsaturated fat. Palm shortening is palm oil that has some of its unsaturated fats removed, giving it a very firm texture, and high melting point. The melting point of our Palm Shortening is 97 degrees F., making it very shelf stable. It is NOT hydrogenized, and contains NO trans fats! When I found Palm Shortening, I fell in love with shortening…again. Now if you’ve got a June birthday and you try to make a buttercream frosting to take it to the park, you will have a mess on your hands! LOL. In the winter, it will harden a bit, but it pretty much stays the shortening consistency all the time. And its super affordable! I pay $35 for a huge gallon bucket of shortening and it usually lasts me 6-9 months. I know people are worried about Palm Shortening and how it is harvested. Tropical Traditions is sourced from eco-friendly sustainable farms. These are small-scale family farms in South America. According to Tropical Traditions website, “These farmers are certified by ProForest, which ensures that they meet strict social, environmental and technical criteria. With regard to environmental criteria, the assessments are carried out at the landscape and operational level at both the farms and processing facilities. These assessments cover environmental impact on the soil, water, air, biodiversity and local communities. The lands the farmers use are not lands that were deforested. The lands used to grow the palm fruit are lands previously used for agricultural purposes (cattle, rice, banana). In addition, they test each batch for the presence of the herbicide glyphosate. Okay, enough about the shortening I use. 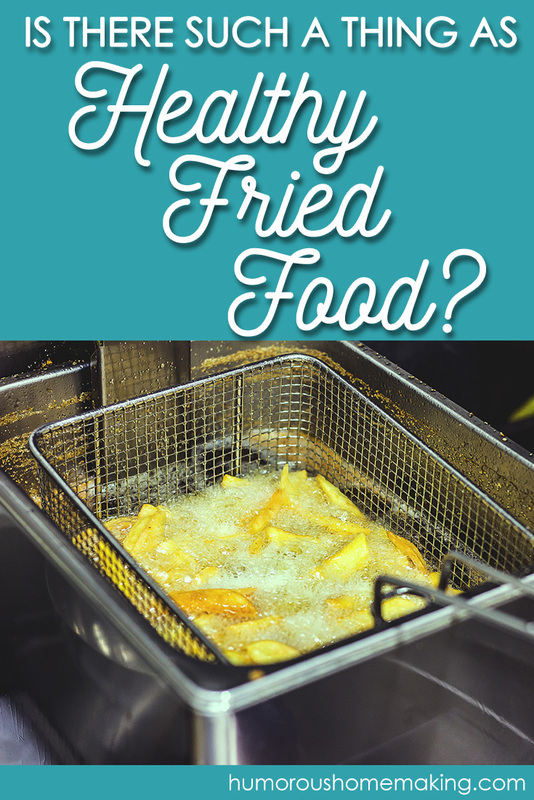 Let’s talk about the fryer and the process! When I’m making my healthy fried food, I use a Waring Pro fryer. And I absolutely love it. It’s older, so there is a newer, updated model available now. But I would absolutely buy this brand again if I am ever in the market. Y’all ask all the time if I reuse the oil I fry in or how often I change my oil. I will use it several times before I change the oil. When it starts to smell like the food I’ve been cooking, I will change it. And sometimes I just use common sense. If I have made fried chicken a few times, I might not want to make donuts in it after that. People have told me they have to change the oil after each use because it’s “dirty” from whatever they’ve been cooking. But y’all – sometimes you just need to strain the oil! The oil itself is still clean, but has particles in it. After it cools, strain it in a mesh sieve and then you can store it as usual to reuse again some other time. Phew, that’s all I know about healthy fried food. But let me just say I am very thankful that I somehow stumbled across Tropical Traditions. And y’all by now that if I love something – I can’t help but share it with all of y’all. Have you tried cooking with Palm Shortening? What do you think about it? I use lard when frying! Just the other week, I made homemade chicken nuggets “breaded” with crushed pork rinds and deep fried in lard. It was DELICIOUS!!! Yum – that sounds delicious. Thanks for sharing! I’m pretty sure the Texas State Fair has fried coke several years ago? We don’t fry very often any more but when we do we use lard or tallow which I render myself. We try to stay away from any oils that come from plants for cooking purposes as most should not be heated to such high temperatures. Guess everyone has to find the thing that works for them. Yes, I agree. I’ve heard a lot of different opinions on plant based oils as well! Glad you found what works for you – and appreciate your comment! Never heard of palm oil. Can you bake with it too? Oh yes! It bakes up a lot like coconut oil/butter/shortening. It’s life-changing for sure!